In March of 1990, one of the most successful independent films of all time was released in theaters to mediocre reviews and box office sales. Unsure if the film was for kids, teens, or adults, Teenage Mutant Ninja Turtles eluded the sensibilities of the critics and the mainstream but it was filled with so many quality enduring ideas that 25 years later the Turtles are as indelible a part of American culture as Batman or Superman. I must admit a personal bias here. This is one of those movies I saw so many times as a kid, that without even looking at the screen I can speak the dialogue in almost perfect rhythm along with the actors. Created by Kevin Eastman and Peter Laird for Mirage Comics, the four brothers named after famous renaissance artists began their journey in dark, gritty graphic novels meant to mirror the grime associated with inner-city New York at the time. 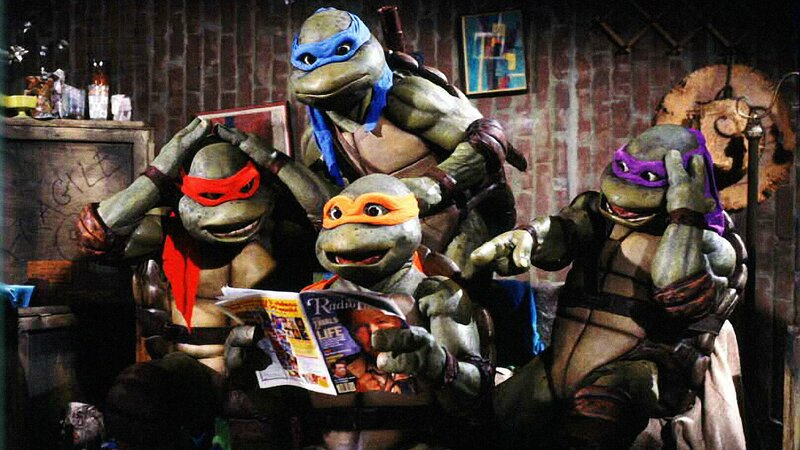 Over the years, merchandising and admittedly smart marketing has turned them more and more into kid’s entertainment but the first feature film showcasing the Ninja Turtles stayed close to the more mature original tone, allowing it to deal with some tough life questions. We see Raphael dealing with his anger issues and in a poignant early scene, sensei/father figure Master Splinter warns him about turning that anger inwards or dealing with it alone. Leonardo is confronted with his biggest fear – Splinter dying and him being left to take care of his brothers alone. Donatello begins his descent into existential crisis as he wonders about the scientific origins of his family. Even Michelangelo, usually relegated to pure comedic relief in TMNT films, struggles with the realization that the world might not be as happy a place as he thinks. He also falls in love for the first time. These characters and subsequent films have succeeded for so long because they understand the emotions of being a teenager. A lot of art is aimed either at small children or fully formed adults who often forget what it was like in those in between years, or maybe would rather forget about them. Containing message after profound and inspiring message, Teenage Mutant Ninja Turtles manages to be an excellent lesson without ever being preachy and great fun without every being brain dead. In this movie, the Turtles are at their height of both representing and satirizing modern American culture. Mikey’s surfer dude attitude and language, Raph’s hardened Brooklyn persona, Leo and Donnie’s everyman, middle-American style make the brothers the perfect vehicle for celebrating and critiquing our culture at the same time. This is manifest in a joke told in the first encounter between Raphael and Casey Jones who uses sporting equipment in battle. When Raph blocks a strike attempt from a baseball bat he remarks, “A Jose Canseco bat? Tell me you didn’t pay money for this.” This is a joke that actually gets funnier with age. In this movie, four brothers struggle with growing up together in the shadows. They get angry and hit things and swear, they make mistakes, fight with each other, and learn how to stick together through a family bond as well as a propensity to joke about pop culture. Jim Henson’s creature shop was responsible for the suits worn by the actors and their incredible work has helped the film age extraordinarily well. Unlike many of the flicks on this list, Teenage Mutant Ninja Turtles was not reliant on soon-to-be obsolete technology in order to achieve its aesthetics. It isn’t easy to put into a defined category. It’s a comedy, action, teen drama that manages to be grittier than most Batman adaptations. The themes are simple enough that they won’t challenge hardened adults, and much of it may be too mature for young audiences to understand, but 1990’s Teenage Mutant Ninja Turtles caught on and catapulted these characters into their own stratosphere. Now Leo, Mikey, Raph, Donnie, Casey, April O’Neil are all household names, catching and even surpassing in popularity licenses that had been around for decades longer. The heart, charm, and humor that led to such success is all found in abundance in one of the most faithful graphic novel adaptations to ever hit the big screen. Only a few months after Tim Burton’s Batman, Teenage Mutant Ninja Turtles provided the real blueprint for making good adaptations of comic books and graphic novels – stay true to the stories and themes embedded in them by the original artists and their labor of love.